The circular device inside this accelerator structure coats the structure with titanium nitride to keep electron clouds in check. Clouds might be welcome during a drought, but you definitely don't want them in your beam pipes. Researchers around the world are working out how to keep a section of the proposed International Linear Collider—the positron damping ring—clear of electron clouds. In curved sections of accelerators, such as a damping ring, the beam throws off synchrotron radiation that plows into the beam pipe walls, kicking up electrons embedded in the wall. The newly freed electrons get pulled along with the next bunch of positrons in the beam, but then some hit the wall, freeing so-called secondary electrons. Soon a cloud of electrons clogs up the beam pipe. "When the beam passes through a cloud, it's like a plane passing through turbulence," said Mauro Pivi, of SLAC's ILC Accelerator Design group. One way to suppress clouds is to choose beam pipe materials that let fewer electrons escape. Pivi, Robert Kirby of the Surface & Materials Science Department, and their colleagues are measuring the "secondary electron yield," looking for surface materials that limit the number secondary electrons produced, ideally to less than one for every electron that strikes the wall. "If the yield is below one, the cloud doesn't have time to form," Pivi said. Researchers at SLAC have tested the yield of a coating material called titanium nitride, already used in parts of the PEP-II accelerator. Recent work done at SLAC and KEK in Japan has shown that the yield decreases after the material has been exposed to the passing beam. Researchers used an electron gun located in Building 40 to measure a yield of 1.8 secondary electrons produced for every incoming electron. Then they took a sample of the material to the PEP-II tunnel. Using a transfer line, they inserted the sample inside the vacuum chamber, plugging a hole in the beam pipe wall. 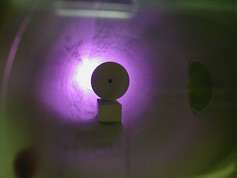 After weeks of exposure to the accelerator's synchrotron radiation, which scours contamination off the walls, the sample of titanium nitride had a yield below one. While promising, this avenue of research is just one of the paths being explored in the quest to keep the positron damping ring clear.